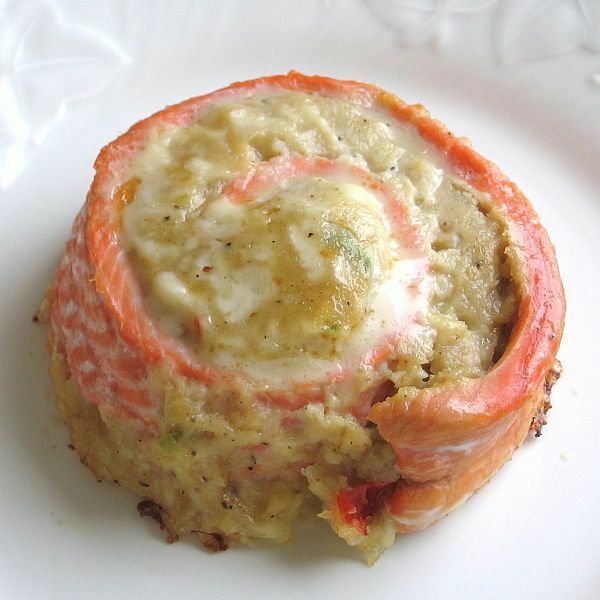 This recipe for Polish crab-stuffed salmon pinwheels is known as zrazy łosos i krab (ZRRAH-zih WOH-sohs ee KRAHB). Crab and other shellfish are common along the Baltic Sea coast where this dish is enjoyed. In a medium skillet, sauté onion and celery in butter until translucent. Remove from heat, cool and transfer to a medium bowl. Add lemon juice, crab meat, breadcrumbs, egg, and dill, mixing well. Cut salmon into two lengthwise pieces. Season both sides with salt and pepper. Spread crab stuffing on each piece of salmon (make sure to spread the filling on the darker side of the salmon for a nicer presentation). If you have leftover stuffing, use it to make crab cakes or stuff into mushrooms. Starting at the wider end, roll salmon up into cylinders. Cover with plastic wrap and refrigerate for an hour or so to make slicing easier. Heat oven to 400 F. With a sharp knife, slice salmon into 1 1/2- to 2-inch portions. Lightly coat a glass baking dish with cooking spray. Place pinwheels in the pan, cut side down and pour wine around them. Brush pinwheels with butter, cover loosely with foil and bake 15 to 20 minutes or until done. Polish Beef Roulade Recipe: Zrazy, as this is known in Polish, common main course offering dating to 14th-century nobility. There are myriad varieties with just as many different fillings, including mushrooms, sauerkraut, herbs, breadcrumbs with horseradish, among others.